In these books, you will find useful, hand-picked articles that will help give insight into some of your most vexing performance problems. These articles were written by several of the SQL Server industry's leading experts, including Aaron Bertrand, Paul White, Paul Randal, Jonathan Kehayias, Erin Stellato, Glenn Berry, and Joe Sack. Volume One contains information about database design, T-SQL, execution plans, performance monitoring, and troubleshooting as well as system architecture and maintenance. Learn about the benefits of indexing foreign keys, the best approach for running totals, ten common threats to execution plan quality, and more. In Volume Two, learn about administration and system configuration, ACID and isolation levels, statistics and cardinality, as well as measuring and performance tuning, SQL Server 2014. 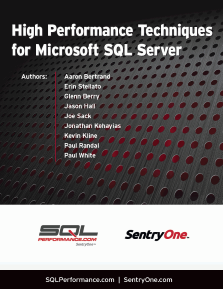 From making the case for regular SQL Server servicing to interesting things about INSTEAD OF triggers, this eBook is packed with useful information. 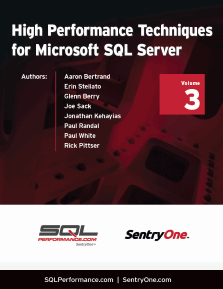 Volume Three includes valuable information about indexes and query optimization, high availability and disaster recovery, and performance tuning and troubleshooting. Learn more about performance tuning the whole query plan, readable secondaries on a budget, and much more. In Volume Four of our eBook, topics covered include database design and structure, query tuning and troubleshooting, and Azure and virtualization. Read about comparing Windows Azure virtual machine performance and risk when using dynamic memory within Hyper-V, as well as many other interesting topics. 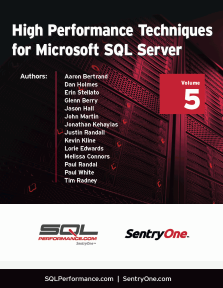 Volume Five offers even more insightful tips with chapters on statistics and table structure, SQL Server 2016, system configuration, and monitoring. Learn more about monitoring for suspect pages, using Microsoft DiskSpd to test your storage subsystem, and hash joins on nullable columns, just to name a few. Download all of the volumes of High Performance Techniques for SQL Server in one archive.